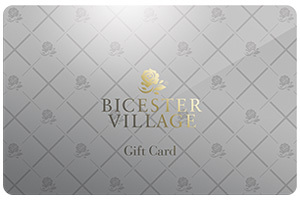 Choose the new Gift Card from Bicester Village and let your family and friends indulge in their favourite leading luxury brands with up to 60% off the RRP. Looking to buy one Card? Please Click here. Please select a Card value between £5 and £300 and the number of Cards required, noting the maximum order value is £300 . Please note that Gift Card orders take 48 hours to process and therefore cannot be redeemed within that time. . Select Mr. Mrs. Miss. Ms.
A confirmation email will be sent to the Gift Card recipient's email address once the order has been completed. Please note the maximum Card value of £300allowed for delivery to address has been exceeded. Please select Collect in Village or enter a lower Card value. Please enter your promotional code below . Please complete the required fields and resubmit. Gift Cards expire and cannot be used 12 months after the date of activation. Please note that all Gift Cards are non-refundable. To view full Terms and Conditions Click here.